Hannah is thrilled to finally be on her way to the Frontier. She and her new husband Bradley have been planning this trip for as long as they have been planning their lives together it seems, and now that they’ve left Independence, Missouri on the wagon train west, it appears that all of their dreams are coming true. Within just a few short weeks of leaving, however, the harsh realities of life on the wagon train strike Hannah hard and she is forced to realize that the adventure she envisioned with Bradley is not at all what it seemed. Her struggle comes to a peak when Bradley suddenly dies of cholera and the wagon train leaves her behind. Though overwhelmed by recent events, she musters the courage to take the reigns of her wagon in order to keep up with the others, but ends up on the side of the road. There, she finds another wagon and, assuming it to be abandoned, is shocked when she peers inside and discovers two bodies. From their appearance, she immediately knows that they encountered the same fate as her husband. Letters clutched in the woman’s hand reveal that she was meant to be a mail order bride to a man named Aaron in Bannack, Montana. Out of desperation to push forward and continue West, Hannah finds herself assuming this woman’s identity so that she can continue on the train. 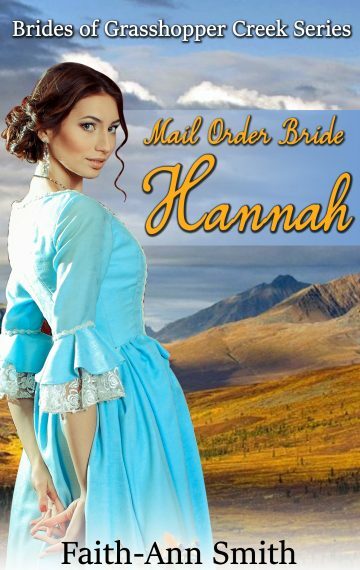 What will happen when she arrives in Bannack, and meets Aaron for the first time? Will she manage to create a new life for herself despite her grief, or will her true identity be revealed, dashing all hopes of a bright future?